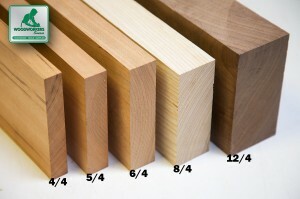 A Project Pack provides you an assortment of typical boards between 4” and 10” wide, and between 48” and 96” long. - Assorted widths 4" to 7"
- Assorted lengths 48" to 84"
We stock walnut lumber with one of the highest possible heartwood specifications that money can buy, called 90/70. That means 90% heartwood on the face, and 70% on the back. While the heartwood content may be greater on some boards, we can not guarantee 100% heartwood. 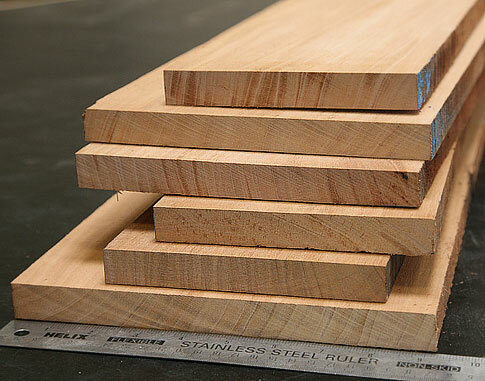 Walnut lumber pack comes with an assortment of widths and lengths. Lengths will vary within this range. A 20 board foot Project Pack is a great way to buy some lumber because they're simple and we stand behind them with our 100% satisfaction guarantee. A Project Pack includes a total of 20 board feet of our hand-picked lumber, and you'll get a fantastic assortment of widths (typically between 4'' and 10''), and lengths (between 4' and 7'). 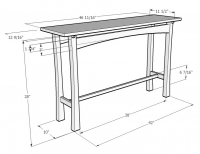 Purchase a Project Pack when you need enough wood to make a medium sized project like a coffee table or cabinet. As usual, all the lumber is surfaced on two sides (S2S), and kiln dried. One of the most enjoyed American hardwoods for its fine-yet-open grain, unique patterns, and bold dark color. Walnut is easy to cut, shape and sand, and the wood takes on an amazing look with a clear finish. Light to dark brown or chocolate brown. A moderate sized tree reaching about 100 feet and producing a trunk up to 60" in diameter. Gun stocks, musical instruments, fine furniture, cabinetry, flooring. Walnut Veneer Pack 7 sq. ft.: 4 pcs, 8" x 32"
Because this was billed as “high character “, I expected some unusable sections but the amount I can’t use from this order seems excessive. For example: I needed a run of 53” but was only able to get 46” due to splitting in the final 12” of the board. The wood was delivered promptly and arrived packaged well. The quality of the selection is fair; roughly milled to dimension, some pieces had partial splits while others had bark on parts of the edge. The biggest issue was that one if the boards had water damage on parts of one face that I had to plane quite a bit to remove. As a first time customer, I had expected better quality from hand picked lumber. The lumber is very pretty. There is a little bowing and some splitting; however, I will be able to work around it. I wanted some nice walnut to make a big coffee table (4x4). This fits the bill perfectly. Nice wood with consistent grain. I also ordered the cut on one side which is well worth it in terms of time. I thought there would be enough material to fabricate some legs but I was wrong. So I called customer service to see if they could provide what I was looking for. They guy even went out to the warehouse to see if they had it. They did not. So he then proceeds to give me other suppliers who he thought would have what I needed. Great customer service there. I cannot say enough about the material provided or the quality of customer service. 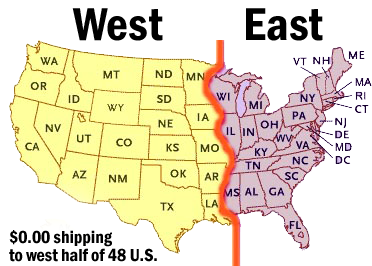 The only down side for me is am located east of the Mississippi so I got nailed with that fee. nice wide "straight" boards with great potential for a coffee table or a headboard. thanks!